The professor Paradox Book of Pirate Party Games: filled with original games, Pirate Lore, and other interesting stuff. 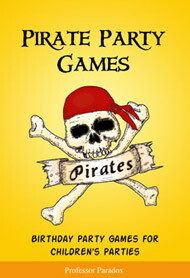 Get the Book of Pirate Party Games Now, Instantly, This Minute, No Waiting! To bring ashore the The Wonderfool Book of Pirate Party Games or download it as ye nerdy landlubbers call it these days, ye can click the button below. Ye will be taken to a page where ye can download it immediately with non o’ this waiting fer shippin’ nonsense. Well yer curious now aint ye? Tell yer what, ye can read an extract of the book of Pirate Party Games so ye know just what ye are gettin’ fer yer very modest investment. Still not tempted? Ah well, there’s no pleasin’ some folks. If ye ain’t tempted by the The Wonderfool Book of Pirate Party Games, yer probably really boring anyway. One last chance – If ye don’t buy the book, ye’ll miss out on the best pirate party ever and yer children will probably turn into teenagers. Actually, yer children will turn into teenagers, and sooner than ye think, so make the most of every precious moment of their childhood! Just so ye know, what ye will get is in pdf format which means ye can save it to yer pooter and read it when you want, ye can print it off and read it wherever ye want like if ye be sailin’ to work, or (this is the best bit) ye can just print individual pages of the games ye want. 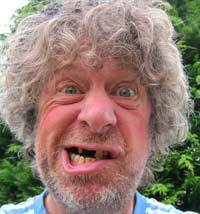 I hope ye found this site useful and will share it with yer mates by posting links to this page on social networking sites, blogs, and forums. Thank ye. "... just brilliant. I am now looking forward to my son's pirate party rather than dreading it....! Many thanks for writing it ..."
"This was quite an intersting read as it gives you some of the myths and meanings relating to pirates, which for boys who need to know everything it was quite nice having an answer. used several of the games and they were very successfull at a party. Gave good ideas and was very easy to use. Definately worth the money." "Three dozen great party games, pirate lore, pirate history, talk like a pirate, plus lots of party tips, and pirate activities for anyone organising a pirate party. Fantastic value and great fun."